I had just returned from a short vacation in Japan. It was a fun-packed trip, but one particular visit stood out for me and that was visiting the Ramen Museum in Yokohama. To be honest, I wasn't expecting much. It was midway through the walk and I came to realize that this museum had much more to offer than just instant noodles history. It was also delicately designed to educate the public on the entrepreneurial spirit behind a simple cup of instant noodles. With the help of my sister's bootstrap understanding of the Japanese language, I quickly took down some notes that I could research and expand on. However, there are more to learn from the museum than what I can squeeze in this article. That will be your adventure for another story. In his late 40s, Momofuku Ando was declared bankrupt after his business failed. But despite the misfortune at that stage of his life, he was still looking forward to his next venture. While walking down the streets of post-war Osaka, he noticed the long queues outside a noodles shop. It struck him then that there was a market demand for noodles that can be prepared quickly. So he spent 1 full year perfecting the instant ramen noodles. 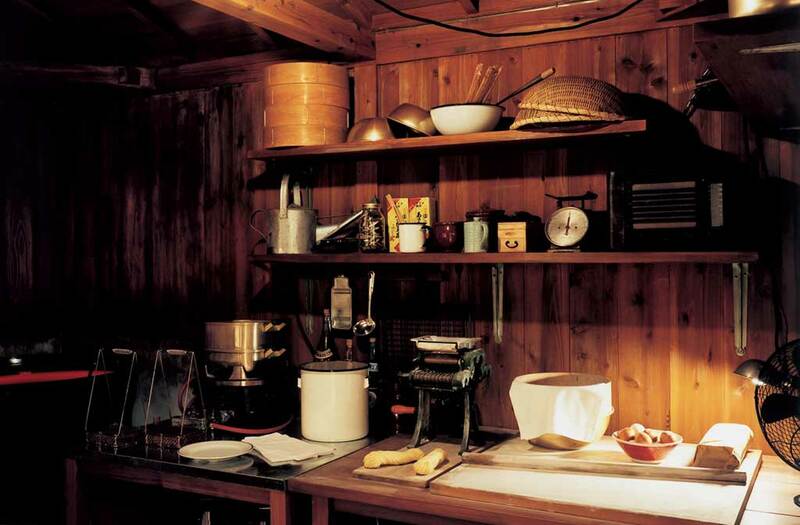 At age 48, Ando started selling his first instant noodles product, Chikin Ramen. The first instant noodle the world ever seen. During the midst of his year-long experimentation, he was finding great difficulty in solving a key step in the making of the instant noodles - dehydrating the noodles. He was getting desperate as his ideas were running dry. But one day, he was observing the way his wife cooks vegetable tempura and it hit him that the solution was in front of him all along! He re-used the same "flash-frying" technique to remove moisture from the noodles. And with that, Ando established the foundation for all instant noodles production. 3) Don’t wait for your customers to come. Go to them. When Ando introduced his instant noodles to the public, it was deemed as a luxurious item because of the relatively high price point. It cost 6 times more than a bowl of traditional noodles. 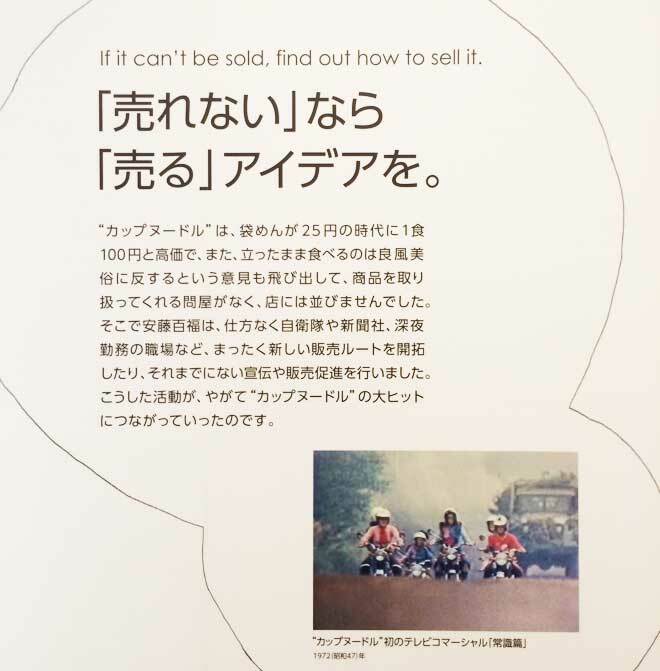 Although it did well, Ando felt that the product wasn’t reaching enough people and he needed people who could spread the word. Instead of just waiting passively, he expanded his sales channels and directly targeted places like news stations and police stations. 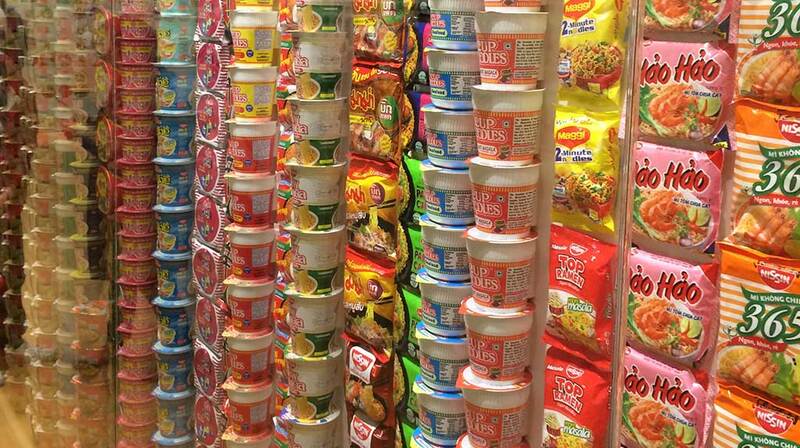 These places had the right demographics for his instant noodles - people who worked late-night and don’t cook. This move paid huge dividends for Nissin. By the end of its first year, Nissin had already sold 13 million Chikin ramen and was still selling them like hotcakes everyday. Ando could have relaxed the gas pedal but he didn’t. At that time, the ramen noodles were all packaged and sealed in a cellophane bag. After Ando’s visit to the US, he noticed a surprising behavior among the American noodles-eaters. They will poured the noodles into a cup and ate it with a fork instead of using a bowl and a pair of chopsticks. he invented the world's first cup noodle where the container serves as the packaging, cooking vessel and serving dish at the same time. With this new-found knowledge, Ando went back to the drawing board. One year later, he invented the world's first cup noodles where the container served as the packaging, cooking vessel and serving dish at the same time. This caused a revolution across the instant noodles industry and made Nissin the success it is today. In order to cope with the global demand, Nissin needed to have their production line operating at maximum efficiency. Due to the noodles' unique cone shape, the top-down placement of noodle into the cup caused the noodles to be inconsistently positioned within the cup. To solve this inconsistency, Nissin cleverly reversed the placement by positioning the cup over the noodles instead. This placement method was completely out of the industry norm at that time. The ramen museum visit gave me a good insight into the gargantuan effort needed to build a company that last for generations. Early mover advantage can only get you that far. Nissin managed to build an empire for themselves by constantly being bold and creative. These are the good lessons that I had documented down in this article to remind myself from time to time. Oh by the way, Ando also invented Space-ram, a vacuum-packed ramen that could be eaten in space. And he did it at age 91.